The Ore to Shore Epic Mountain Bike Race has been on my race to-do list since getting back into biking a few years ago, but was kind of sitting on the back burner until now. I had rearranged my summer plans after injuring my ribs back in June and was no longer going to travel out to Medora, North Dakota for the Maah Daah Hey 100 and decided that I could fit the Ore to Shore into my schedule. I had heard that the race is a fairly easy course and that it is basically a road race on dirt. The overall elevation is very light at only 1,500 feet of climbing with the biggest climbs coming in at only 200 feet and taking over a mile to gain that elevation in most cases. Those things are all true, but I wasn’t expecting some of the rocky trail and a few of the really steep grades. I actually did 3 hike a bikes over the course of the race. 2 of them were ridable, but it was just as easy to jump off quick. I have come to the conclusion that no race is easy. Some courses are easier to ride than others, but no race is actually easy. 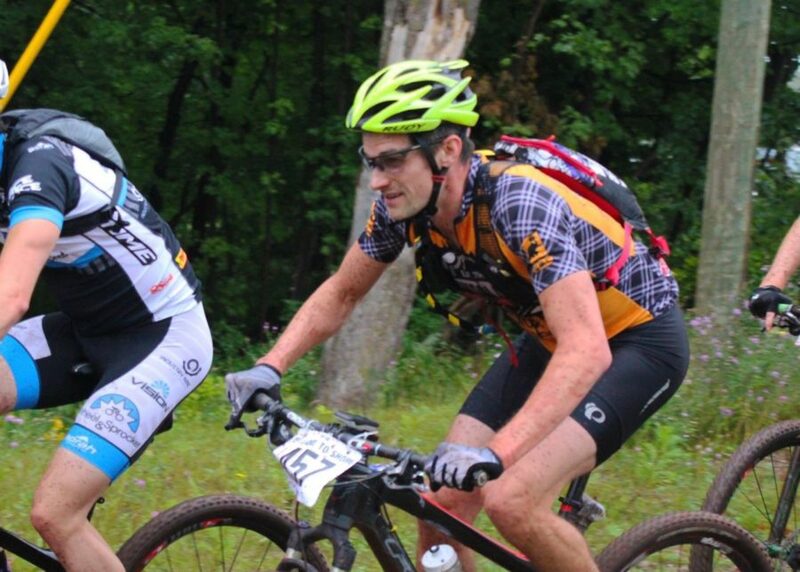 The Lutsen 99er and the Ore to Shore Epic are both easy race courses, but can turn out to be an extremely tough races as the the pace and intensity tend to increase as the course difficulty decreases. This would all be true with the Ore to Shore Epic. Audio version of this report with additional commentary now available on my Podcast. We actually arrived in Marquette, Michigan on Thursday afternoon and I had plenty of time to get prepared for the race. I had actually been on the road traveling for a few weeks and the Ore to Shore was the last stop of our trip. I had recently replaced my rear derailer, cables and housing after damaging my rear derailer. I am running cheap SRAM 2 X 10 stuff and replaced my derailer with the new SRAM GX 10 speed derailer. It’s a little heavy but shifts decent with my old X.7 shifters. The shifters feel a little worn and abused, but they are getting the job done. At any rate, I was able to get a short warm up ride in on Friday, down the rail trail and dial in my derailer while doing a few short sprints to keep the cardio system loose. I lubed the chain and called it good. My bike was pretty dirty in general, but my drivetrain and suspension pivots were good to go and that’s all I was really worried about. The forecast was calling for rain during the race anyways. My race set up was pretty simple… I would carry 2 liters of water in my hydration pack and a large water bottle on my frame mixed with 3 scoops of Carbo Rocket 333. I would plan to have the Carbo Rocket finished by the 2 hour or no later than the 2 hour and 15 minute mark. I taped 3 GU Roctane gels to my top tube with the intention to take one every 45 minutes and thru a Honey Stinger Energy Bar in my pocket for emergency purposes if the gels didn’t work out. I only carried 1 tube and that was taped to my frame. I also had a couple air cartridges, multi-tool and chain links in my hydration pack. This is a little lighter than I would normally pack for a long endurance race, but I didn’t think there was a need to over do it here. 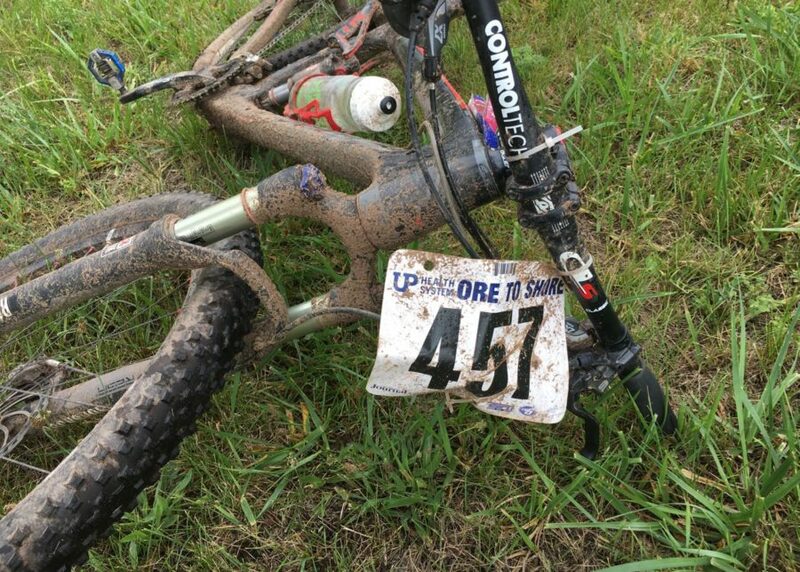 I have to laugh a bit when I say that, because this race was 48 miles and definitely in the Endurance mileage category, but it would be such a fast pace and high intensity that I was looking at it like a long sprint ride and knew there would be no endurance pace riding. My wife headed up to Neguanee with me before the start of the race in time for me to drop my bike off in the starting gates and then relax a little before the race. I was unsure what the start line area was like and wanted to get a decent spot in the general population gates. I was pretty confident I could finish under 3 hours and would have been happy or satisfied with that, but a big part of me thought I could do it under 2:50 if I had a good race and 2:40 would probably be the race of my life for where I am at today with my riding. Anyways, I set my bike up about 4 or 5 rows back in the general population gate and was confident I could roll out with those folks. The question would be if I could hang in there with them for the duration of the race. I did run into a reader of my race reports, by the name of Darin from downstate Michigan (if I remember the name correctly) before the start of the race. Thanks for saying hi and I hope your race went well. I enjoy documenting my races on here, but it is always nice to hear that somebody enjoys reading them and following along, as it does take a bit of time to pull the details out of my head and put the reports together. Anyways, after dropping my bike off at the start, I dropped a chair at the back of my truck and put my feet up until the start of the race. About 30 minutes before the race, I ate a bag of those Extreme Jelly Belly Sport Beans… A little preemptive fueling for what was sure to be a fast start. I was about to head to the start line when a guy came running through asking if anybody had a spare 26 inch tire. I guess he had just blown out his side wall. I didn’t have any spares, but my wife’s bike was sitting in the back of the truck and she wasn’t going to be riding it, so I told him he could just take one of the tires off of it. He offered money, but I told him to just take the tire. He asked for my race number to try and find me at the finish. I told him if I didn’t see him, to not worry about it. I am sure that I may need some help like this before the start of a race one of these days as well and hope there will be somebody there to lend a helping hand. I headed to the start and had planned to eat a gel right at the start line also, but I totally forgot once I got up there. I chatted with a guy next to me by the name of Shawn at the start line for a couple minutes, while we waited for the start clock to tick down. Regardless of how the race goes down, we really are among friends and like people at these events. If I remember correctly, Shawn also had small kids, like myself. Ironically, he also had injured his ribs back in June, but while racing in the Lumberjack 100 vs falling off a truck like I did… The National Anthem was sung and we were ready to roll. The rollout was fast with a really sharp S turn less than a quarter mile from the start line. We were still under a pace car rollout and I actually didn’t see one close call. Things heated up after the S turn and people started making moves. We followed some paved streets that led us out to an atv trail on the edge of town where we started hitting a few hills. I average 25.6 mph in that first 2 mile rollout. I took off strong, but I held back a few matches. My legs were feeling a little heavy, but still working strong. They probably should have been feeling slightly heavy as I wasn’t necessarily in peak form, but I was slightly concerned as they should have felt a little fresher than they did. Regardless, I continued pushing hard. The atv trails would take us up another 200 foot over the next mile and a half with a little bit of rougher trail that included some sharp and jagged rocks. A fat biker in front of me got a puncture and you could see the sealant spraying out like a sprinkler upon every revolution of the tire. It looked like it was starting to seal, but I lost him in the crowd and not sure if it ended up sealing up for him or not. My legs were starting to loosen up and and although they felt slightly heavy, I was strong on the short climbs and picked off a few places. That being said, there were always a few folks that were stronger and moving up the climbs faster. We eventually passed over a county road, hit some rail trail type of path and then briefly dumped out on a city street as we passed thru Ispeming. The miles were flying by as we were on a crazy fast pace and I knew we were not far from the first aid station at the 10.1 mile mark. We weaved thru a few dirt paths, under the highway next to the rail road tracks and came thru aid station 1. I felt like I probably gained some spots in the traffic up to this point, but it is hard to tell at times with such a mass start. Thanks to Ben Mullin from the CyclovaXC Team and the Woolly Bike Club for passing on the above photo with a few others. I believe this photo must have been taken somewhere in this first section of the race. By the way, if you enjoy reading race reports and especially if you ski… then I recommend checking out Ben’s XC ski race reports at the Cyclova website. Check the links at the bottom of this report and bookmark it for winter. There are some good ones in there from last winter if you search back in the blog feed. We were on a long rail trail after passing thru the first aid station and I could see another line of riders way up the trail. I was feeling decent and decided to make an attempt at bridging the gap. About halfway across I was starting to regret it, but I knew I was closing in. I finally caught on to the back of them just before the line came to a granny pace as we made a hard left onto some atv trail thru a mud puddle where there was a little traffic jam. That was definitely a wasted effort as the line of riders that I had left behind were back on our tail as we got all jammed up making the turn up the atv trail. I guess this is where knowing the trail better would have come in handy. It was rail trail, but it is not easy closing a gap on dirt when the folks you are dropping and the ones you are chasing are already doing 19 to 21 mph. We were back out on a gravel road and then it seemed like we weaved in and out of a couple gravel roads and short atv paths before finding ourselves on a few miles of backcountry atv trail and then another easy gravel 2 track path up to aid station 2. I think it was somewhere in here that we got jammed up at a short, but wet little bridge over a washed out section of trail or creek bed. It was also around this area that another rider had gone down in the trail in front of us. Most of us jumped on the brakes, but I heard somebody behind yell out “on your left” to make a pass. I know it is a race, but we had a guy down in the trail in front of us. Luckily he was getting up. I yelled out to ask if he was ok as he was getting up and he said “yeh, I think so” and was remounting. The pace picked back up again and eventually that rider that had crashed earlier was back up with us and and eventually disappeared in front of me. It is not that there was really any technical riding here, but the trails were extremely wet and some of the ruts were very unpredictable. I had a few close calls myself as we would come flying downhill and then make a hard turn into another section of trail and start washing out the front end over some wet rocks or get caught in a tire rut. That morning, I had made a last minute call to up the tire pressure and shock pressure. I was running pretty hard tires at this point, thinking about keeping them fast rolling… But they were definitely too hard and I was missing some traction on the front end that I was use to having. My shocks were sitting at about 25% SAG also, instead of the 30% that I normally run. I reached down at one point and tightened up the rebound damping on the rear shock, but my front shock damping adjustment is on the bottom and not reachable. At this point, I wish I would have just left them alone and I probably would have floated over the sand better and had more traction in fast corners. I feel like this 5 miles of trail is where I lost ground in the race overall. I took off strong from the start line and hung in there for quite awhile. I burnt and wasted a few matches by bridging some gaps that would have been pulled in anyways because of backups in corners, the little wet bridge crossing and somebody going down in the trail. I was starting to pay for it a little bit now and knew that I needed to regroup a bit. I wasn’t feeling bad, but I knew I wouldn’t be able to hold that same pace for another hour and a half if I didn’t regroup a bit. I jumped off and hiked up a sandy section at the start of the power lines as I thought I would just burn up needed matches spinning my tires in the sand. I wasn’t the only one that hiked it, but there were definitely folks pedaling through it and cleaning the section. Then came misery hill and I could see the line of riders hiking it as I approached. I jumped off a little early and started hiking it. I lost a few spots as a couple folks were able to ride up a little further before we all fell in line. I took it easy on the slick wet rocky downhills in the power line section, losing a few spots in line here, but also picking up a couple spots from folks taking it even easier than I. 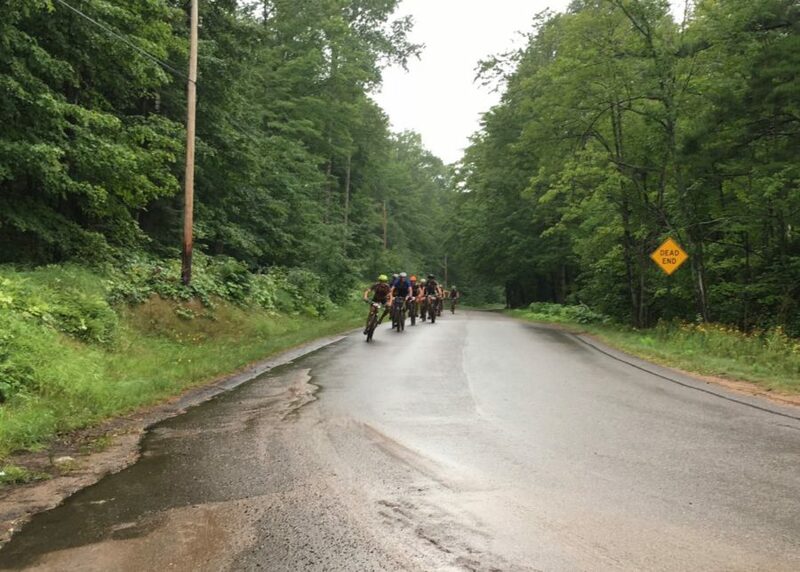 This wet slippery rock was the perfect place to take you out of the race with one bad bike handling move that happens easily in such a fatigued state. This few miles of power line section is where I fell off pace the most. When I came out of the power line section, my average overall pace for the race was down under 16 mph and I knew I had some work to do to hit my sub 3 hour bottom line goal. When we popped out on the road after the power lines, I was feeling good again and that short little dial back of pace was exactly what I needed. I was ready to hammer on things again and I believe this is where I started hooking up with a few other riders and taking turns with some pulls. At times, there might be a line of 15 to 20 riders, but I always tried to stay near the front of it, even if it meant taking extra pulls. I guess I would rather take a few extra pulls pushing the pace than get forced off the back of the line because of somebody else falling off pace. This was definitely a fast paced group, but we were all still in different places when it came to the hills and the pace line would usually blow up or turn into a blob about a quarter way up any of the hills. I came through mile 28 feeling pretty decent and taking the pull. We made the left hand turn up 510 and I could see we would climb for a bit and knew that we could really fall off pace here if we didn’t keep the pressure on. I stood up on the pedals coming out of the corner to get some momentum going again and kept a strong pace up the climb. I felt it when we got to the top, but if I remembered the course profile correctly, I knew it was mostly downhill from here and figured I could burn a few matches up the hill. Sure enough at the top of the hill we turned off into some more atv or double track type trail and were headed downhill again. At this point, I can’t remember a lot of specifics of the trail, but I think it was more double track, snowmobile or atv type trail. I remember it being fast with a couple of fairly steep downhills. I can’t remember exactly how it happened or why, but I do remember dropping to the back of the line at some point. I was getting antsy, but kept my cool and sat in for a mile or so to pull things together and take in some fluids. I was getting worried though, because I had heard there was new single track and thought we would be coming to it soon and I didn’t want to be in the back of the train when we entered it. These guys were all moving fast and staying on task, but everybody fatigues and I didn’t want to be the last guy in line for 2 miles of the only single track in the race. We eventually popped out on a gravel road and I jumped out of line and made my way to the front. Ironically, we dumped into the single track only seconds later and I was pumped to hit it first. Now I didn’t want to be the guy holding other people up and I had to hammer the trail right after burning a match to pull myself to the front. It was newer single track but it was still fast and I felt like I rocked the single track. I flowed through it well and carried good momentum. I was burnt a bit when I came out of it, but there was one other rider that was right on my tail coming out of the single track and I believe we popped out on a short section of sandy single track where he eventually came around me. I was in the home stretch and could feel the fatigue setting into the legs. There was one really steep short climb somewhere in here that was sandy, but I made it all the way up. My legs were spent at the top and it took me a few spins to get my legs back under me. I probably should have taken another gel a few miles back as I had only touched one of them so far. However, I knew I was in the home stretch now and there wasn’t any fuel that was going to hit my system in time to do me any good before the finish line at this point, so I pushed thru it. We hit some more trail that was kind of like single track, but not quite that narrow. I was pretty focused and knew we were closing in on the finish. I was on a great pace and way under my 3 hour bottom line goal even though the fatigue was getting heavier. I heard a “go Steve” from the woods, but didn’t see who it came from as I was focused on the trail ahead. I thought it might be Ben Mullin and I later confirmed that it was indeed Ben. It is always nice to get a shout out from a familiar voice. I knew I only had a couple more miles of trail and then I should be hitting some rail trail or roads to the finish line. The last couple miles went by quick before I popped out on the road and then was directed toward a rail trail. I was on the edge of town now and knew I was close to the finish. I could see some folks lined up on the side of the path cheering us on and then popped out on a road again. I could see the finish and was in full effort at this point as I always like to come across the finish feeling like I left everything out there. I ended up coming across the finish in 98th place overall at a time of 2 hours 46 minutes and 4 seconds. I was really pumped about finishing in the top 100. As I mentioned earlier, I was really confident about a sub 3 hour race and I knew there was a chance I could finish under 2:50 if I had a good race. I really needed to have a good race for my own personal motivation also, as I really hadn’t felt like I raced well this year, aside from 1 or 2 fat bike races. I really enjoy the adventure and accomplishment of the 100 milers, but I really liked the Ore to Shore Epic Mountain Bike Race and will probably be back again. It was great to be able to go race like that and not have to worry about aid station stops and being wrecked for the next week or 2. The Ore to Shore was a really well run event and I can see why people have suggested that I get up there to race it. Ore to Shore fit in nicely between a couple training blocks I am putting together to better prepare myself for the Marji Gesick 100 in September and I look forward to visiting Marquette again. 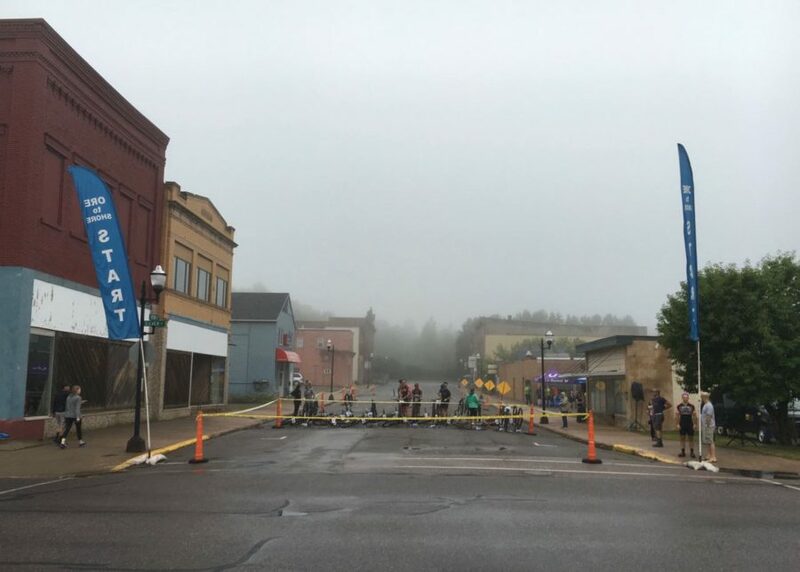 Michigan’s Upper Peninsula never disappoints and it is awesome to see a community like Marquette gather around and support events like this. Big thanks to my wife for driving out to a couple spectator points to cheer me on during the race and snap a few photos for the race report! The kids were hanging out with some family in the area and I think my wife enjoyed being able to watch some of the race without having to watch over the kids at the same time. I may hit up another race between now and the Marji Gesick, but it will likely be a last minute call. Regardless, I’ll post out a training report prior to the Marji Gesick with some good nerd out data in it, so keep an eye out on that. Speaking of nerd data, I averaged 166 bpm heart rate for the duration of the race and spent 2 hours and 15 minutes in my heart rate threshold window. Keep in mind that threshold window has a spread above and below my threshold, so quite a bit of that time was actually sub threshold, but still in the window. I use the Andy Coggan calculations for heart rate training zones. I had 15 minutes in my tempo zone and another 15 minutes in my V02 max window. I may go in and break it down further for one of my upcoming training reports. I am interested in this stuff and enjoy learning something new whenever I can. I did get an automated notification from Training Peaks that I needed to bump my threshold heart rate to 170 vs the 166 that I had it set at to calculate my training zones. I personally over time have felt that the Training Peaks automated notification seems to be accurate for how I felt any time I’ve ever gotten one of the notifications. I also thought it might need to be adjust up a couple points anyways after some a couple high intensity rides I did earlier in the week, but I wanted to see how I felt in the race before making some adjustments. The cool thing is that I feel like I am getting a better read on where my body stands, which is helping me know when to push and when to back off. 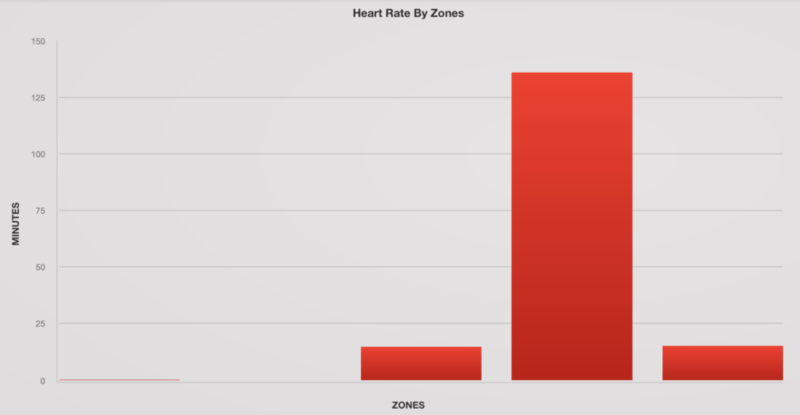 Below is a screen shot of the heart rate zone data from the race. Once again, thanks for reading. As always, feel free to hit me up if you have any questions. Leave a comment or share with a friend who might be interested.